As most of you know, my daughter Teal and I had an epic journey into the desert southwest last May in celebration of her graduating with her Master’s degree. During our trip, we saw many wild and wonderful places that she had not been to before. It was only fitting that her wanderlust Daddy act as her guide into one very huge adventure. She had chosen a very active celebratory trip and she’s in her late twenty’s so no problem, right?! Her Daddy is in good shape too but still again, getting up hours before light and going to bed late with miles of backpacking interspersed makes for a very rewarding but tiring day. Also, some of the places we wanted to see have specific times that you can enter them. Many are controlled by various Native American Nations and as such, they are heavily gated and locked down until opening time rolls around. Unfortunately, this seldom if ever coincides with when we want to enter which is early so that we may have great light and small or no crowds. So there we sat in the darkness in front of a locked gate after leaving Albuquerque before light one morning. If you are dyed in the wool, you just have to try. Of course, a guy opened the gate about an hour before opening and promptly re-locked it. Watching him sit in his truck and read a magazine for a hour while he killed a big bag of Cheetos really hurt my feelings as light begin to spread over the landscape and bare and interesting rocks began to take shape. Finally, the gate was opened and Red sped through like there was no tomorrow. Teal had invested in a little nap time and she began to stretch and get ready for her pack and the inevitable hike and climb into the slot canyon; at the end of it, we would start a much steeper climb that would culminate at the Tent Rocks. To digress for a moment, the Native American name for this place is Kasha-Katuwe means “white cliffs” in the traditional Keresan language of the nearby Cochita Pueblo. 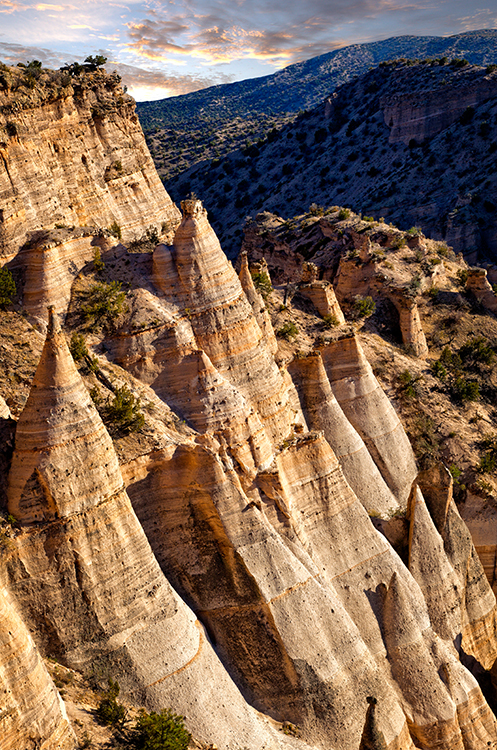 The tent rocks were formed by pumice and tuff of exploding volcanoes in the Jemez field 6-7 million years ago. The deposits are a thousand feet thick and have begun to erode away creating the unique formations of the “tents” that we see today. Enough of this, on to the story! The first half mile of trail seemed innocuous enough with only a slight incline to stretch our calf muscles out. As we were a entered the slot and began to climb up and out, things began to change. We had to do some scrambling and bouldering for the next mile before the slot dumped us out on a series of cliffs and ridges leading toward the mesa top. By then, we were pretty dusty from all our scrambling. The trail became very steep and I had to start climbing hand over hand in a couple of places. After about another 35 minutes, we achieved the mesa top a little scuffed up but not really any worse for the wear. Teal is like her Daddy in that she enjoys the climbing associated with this type of adventure. I took a quick look around orienting myself with the Google Earth research I had already done for the location. I inched out onto a high and narrow ridge as Teal followed. I had to crawl to get right to the end so I could make the composition I needed to. Teal got in behind me and held onto my F-Stop back handing me what I needed to shoot. The wind was coming across the precipice at about thirty and it was rather un-nerving as I was afraid of gear, life and limb. The camera fired and it was over. We backed up toward safety and had beef jerky and dried almonds for lunch before heading back toward the starting point three miles away. This is a very unusual area and we saw almost no one. If you get a chance, check it out yourself. The climb isn’t really too bad and you will see formations like you have not seen before. That is, unless you are from Turkey where they also have a smaller version of the “tent rocks”! Stay tuned for more Daddy/Daughter adventures!